Since these cute little fluffy things arrived on Christmas morning we've been wanting to buy some leads and harnesses so that they can have some walks outside (apparently pet rabbits do need to have lots of exercise) without getting eaten by roaming cats or lost by inattentive children. 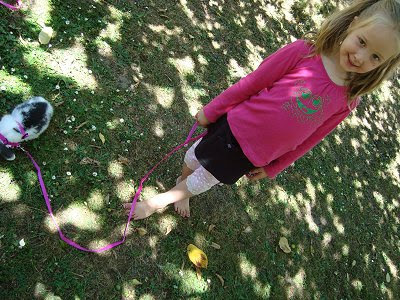 I was rather horrified to find that a small harness and lead set would cost well over $50 in our local pet shop - and we wanted two. My ever so D.I.Y. 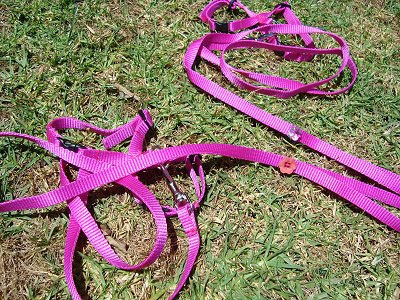 husband was adamant that we could make our own - so we took the plunge and check these out... two very pink harness/lead sets for two very happy bunnies, and for under $5 per set. Wow what a very clever man you have. You may have just found yourself a niche in the market! ok wow that is very macgyver! we need a couple of those too especially today as the kittens keep jumping out of the windows itching to explore our yard but not allowed out yet on their own. ahhh yes, I have memories of chasing 10 baby rabbits (the size of tennis balls) around the backyard. That's the sweetest thing I've ever seen! 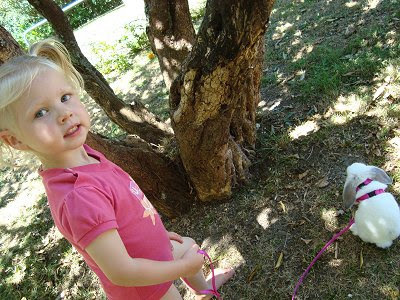 Gorgeous little bunnies on leashes with gorgeous little girls! 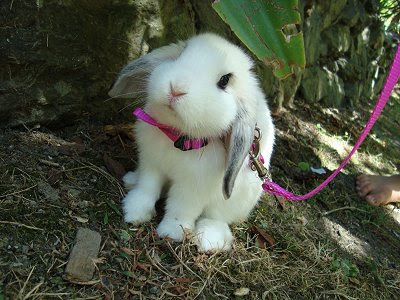 Well done on the bunny leashes! Very inventive!! C U T E !!!! Gee people make some big money on the backs of the theory that people can not be bothered with making their own stuff don't they? Good on you guys! Those are so cute! ....and the bunnies are not bad either! Grandad says, "Haven,t I got a smart son!!. Clever boy Symon. Those leads are amazing! Way better than the ones in the petshops. Haha the rabbits look soo cute in their new look, M and K seem just as pleased (if not more) than the bunnies! Oh my gosh those bunnies are super cute, as are your girls!! Well done on making bunny harnesses - how clever are you guys?! !